It’s the second weekend of February. I’ve just returned from a business trip in Copenhagen where the snow lays fresh on the ground and the temperatures barely broke freezing point. Whilst people’s perception of Denmark is that at this time of the year it is a frozen wasteland, the snow has arrived nearly two months later than normal – hardly ideal when their football league is coming towards the end of their winter break. A few inches of snow doesn’t stop sport in these parts. A few years ago I experienced the lowest temperature I had ever experienced at a football match in Randers, in the north of Denmark when the FC Copenhagen were the visitors in a game played among piles of snow and temperatures as low as minus 15. It was November. Today it is February and we are still yet to see any of the white stuff. We know though that when it arrives it will be the worst winter ever . Because we need more issues with the weather right? I can’t remember a day when it hasn’t rained this year. On Friday I was supposed to be heading for the bright lights of Newport County but their game against Fleetwood Town fell victim to the rain. To add insult to injury (as well as the reported £180,000 the club has lost since late December) the Football League had written to the club to “express concern” at the fact their last four (now five) games had fallen victim to the weather. Really? As if the club needed any reminding! They even approached AFC Wimbledon, opponents for their next home game on Tuesday night to see if the game can be played in Kingsmeadow, but I am sure there is a rule somewhere the footballing authorities have saying they can’t. But what about further down the leagues? Some County League clubs haven’t seen any action since mid-December. In the Ryman League once again over 80% of the games this Saturday were cancelled. Of course the league authorities are all over the situation, giving help and support to the clubs who are suffering. Yeah, right. Not a word apart from a reminder that when a game is cancelled, we need to re-arrange it as soon as possible. Our postponement count so far has now reached eight games. Eight games that we now have to fit in somehow, somewhere. And that is before any of the potential white stuff arrives causing more chaos. Our game today away at Enfield Town was called off DESPITE the pitch being playable when the pitch inspection was carried out. The referee decided, without any consultation with Lewes, that conditions would get worse and it would be an issue for us to travel at 9.15am. Thanks for that. If he would have bothered to ask he would have found out we were willing to travel. With clubs up and down the country in a similar position surely the leagues need to start taking action now? We already have nine games scheduled for March. Who benefits from that? Certainly not our attendances as fewer away fans are able to travel during mid-week, certainly not our finances as non-season ticket holders can’t afford to attend all the games (we currently have 4 homes games in 11 days), certainly not our pitch which is already suffering from constant pools of water sitting on the surface for weeks on end and certainly not for the players who face a strain on their normal working lives in playing all of those games. But there is a proven answer. Two letters – 3G. 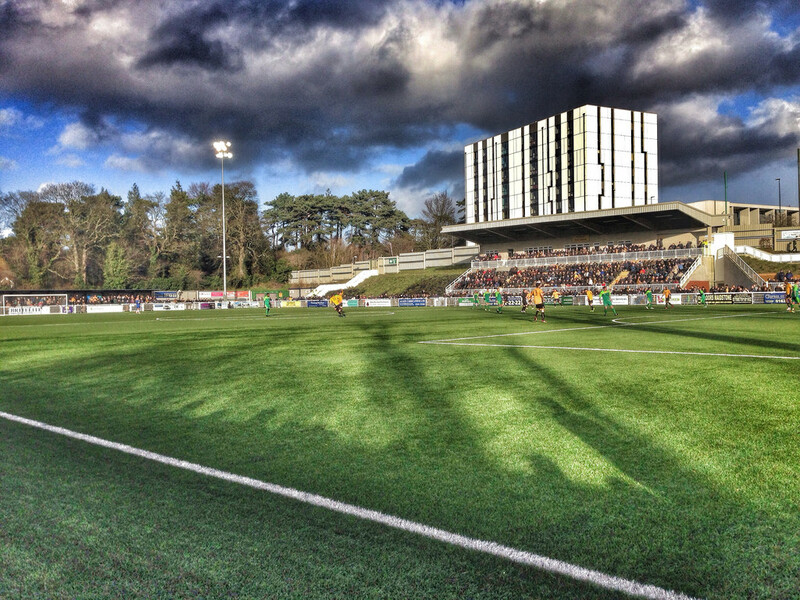 Anyone who watches games in the Non-Leagues in the south of England knows about the success of Maidstone United and their Gallagher Stadium. They took a risk in building a 3G pitch and it has paid off. Regular crowds of over 2,000 at Step 7 of English football, higher than many teams in the Football League have supplemented the income generated by having an asset that can be used for 10 hours a day, seven days a week. Whilst other fans are forced to head to Ikea on a Saturday afternoon at the moment, Stones fans cram into the Spitfire Lounge, spending their cash over the bar before watching their team lead the Ryman Premier League. Life is good in Kent. Or so it should be. Alas, Maidstone’s charge up the leagues ends here. Two weeks ago the Conference sides met to discuss the prospect of allowing 3G pitches in their structure. They voted against allowing them, thus denying Maidstone any chance of promotion. 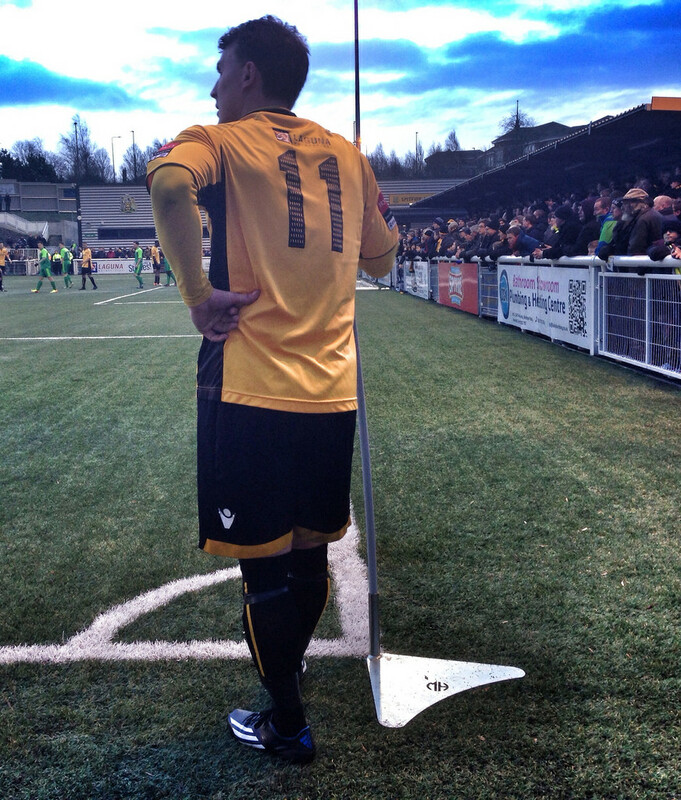 However, Maidstone aren’t taking this laying down, and quite rightly so. The voting process was not representative of all of the clubs. Whilst the Conference Premier clubs each got a vote, those in the North and more importantly, the South where Maidstone would be promoted to, had just four votes for the whole league. Second class citizens? Absolutely. The vote was in favour of not-allowing 3G by 21 votes to 11. Conference South clubs like Sutton United are championing the cause as they are very keen on installing one themselves. Their manager, Paul Doswell, summed up the situation clearly:- “It is all about promotion to the Football League, where 3G pitches are not permitted. Most Premier clubs have ambitions of promotion so they are not going to vote in favour because it does not suit them. “They are not going to consider the clubs further down the pyramid and do us a favour – this is just them looking after number one.” With no sense of irony today, 9 of the 11 games in the Conference South (and 7 out of 11 in the Premier) were postponed whilst the Stones welcomed Canvey Island and 1,794. spectators, a bigger attendance than at every game in the league above bar one. Maidstone United 1 Canvey Island 1 – The Gallagher Stadium – Saturday 8th February 2014 With Lewes’s game being cancelled I took the opportunity to slip on my scout’s coat and head down the M20 to take a look at The Stones. We are due to play them in 4 weeks (another re-arranged game) so you can never watched enough of an opposition – well that’s what I told The Current Mrs Fuller anyway. This was my third visit to the Gallagher and on the previous two occasions (in July and August), the torrential rain had put the completion of the games in doubt. Third time unlucky? It certainly appeared that way as I headed down the motorway. The ground was buzzing when I arrived at 2.15pm. The bar was rammed with people enjoying the Arsenal thrashing on the TV and the number of fans with various other club’s coats, hats and scarves suggested that once again this was the last cab on the Non-League rank. Whilst our cupboards have been bare for weeks, Maidstone have been dining on fillet steak – and they deserve a bit pat on the back for that (and Harlow Town in the Ryman North who also have a 3G). As if my divine request the rain held off for nearly two hours whilst the game was played. Dare I say it that the sun even made a rare appearance. Your remember the Sun? Big yellow ball of fire in the sky? That’s the fellow. Well, he seemed to enjoy his afternoon out even if the Stones fans didn’t. The club had recently brought in Luke Rooney, the ex-Gillingham wide midfielder. Playing week in, week out in front of four figure crowds means that they can afford to bring in players of his calibre and manager Jay Saunders changed his formation to accommodate Rooney. The Stones got out of jail late in the game when Collin converted a penalty after Attwood was brought down by the Canvey keeper in a game that they were second best in most areas. Canvey had begun with John Sands in their starting XI, the man who scored a 20 minute hatrick against Lewes just a few weeks ago and the striker was a constant thorn in the side of the Maidstone back-line. The home crowd groaned in frustration as the away side’s sturdy defence held firm on the perfect surface. Half-time, with the game scoreless, the crowd headed for the bars and catering facilities to boost the finances even further. The visitors took the lead early in the second half when Curran’s near post run wasn’t picked up and he had the easiest job to head home. 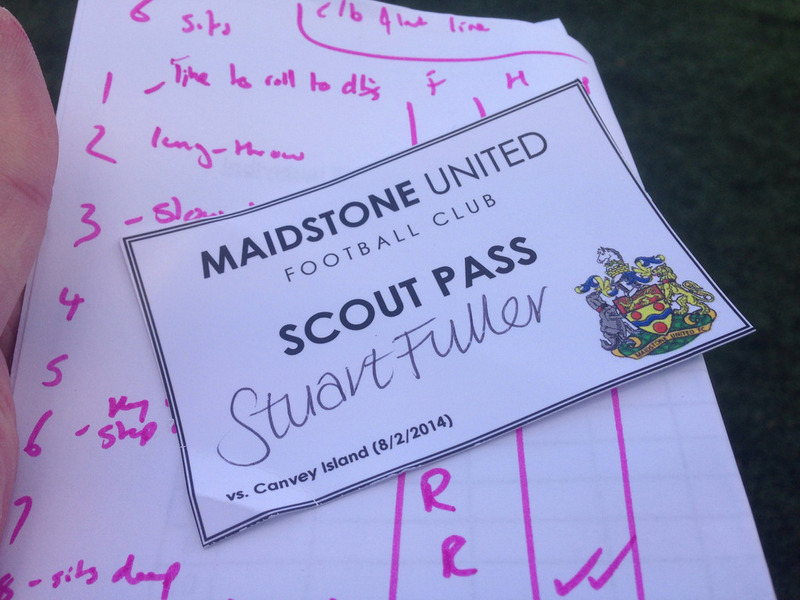 Maidstone huffed and puffed but simply couldn’t break down a determined Canvey side who looked rejuvenated since Sands joined them at Christmas. But they couldn’t hold out. With their goal under siege, Attwood burst into the area and was brought down by keeper Chalmers-Stevens who could be thankful he only got a yellow and Collin smashed home the spot kick. The rain started falling again just as the final whistle blew. Over 1,700 fans may not have seen the best game of the season but it was a game and in the current scheme of things that is as rare as our footballing authorities doing something to help clubs at this level. The Conference may think they have won the 3G battle but I think the war hasn’t yet started.